Darker counties have higher death rates from prescriptions drugs from 1999 to 2014. The data from the Centers for Disease Control were analyzed and mapped by DrugAbuse.com, a for-profit research, education, and treatment referral organization. The death rate from prescription drugs climbed three times faster in rural areas than it did in the urban cores of large cities from 1999-2014. Opioids like oxycodone and hydrocodone were a major of the increase, data show. Rural counties have seen a disproportionate jump in deaths from prescription-drug overdoses in the past 15 years, increasing at a pace three times that of the nation’s most urban counties. 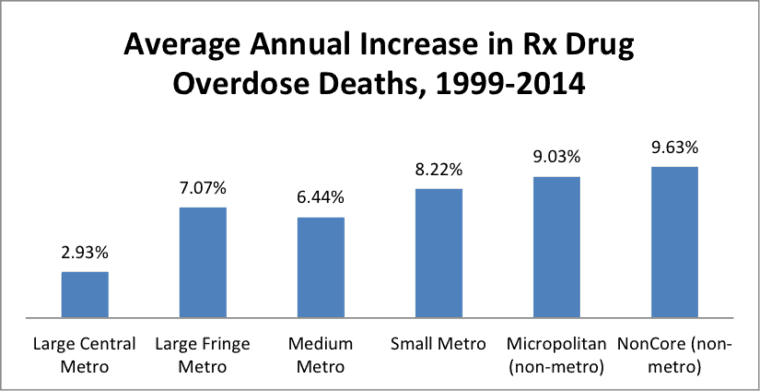 The prescription-drug death rate in counties with small cities (10,000 residents or fewer) has exceeded the death rate in the core counties of large cities (1 million and up) since about 2007. About three-quarters of all U.S. deaths caused by prescription drugs in 2014 were from opioid pain killers, making prescriptions a major part of the nation’s opioid epidemic. Rural – or “noncore” – counties saw an average increase in prescription drug deaths rates of about 9 percent per year from 1999 to 2014. Central counties of large metropolitan areas (1 million residents or more), on the other hand, saw the death rate climb by less than 3 percent per year on average over the same period. Rural counties started with lower prescription-drug death rates than cities, so smaller increases in raw numbers of deaths in rural places can mean a sharper growth in the death rate. But by the end of the study period, rural counties’ prescription-drug death rates equaled or exceeded the rates in metropolitan areas. The graph shows that as the county classification became more rural, the rate of increase in prescription-drug deaths climbed, generally. The exception was in the suburbs of major cities (“Large Fringe Metro”). “Large Metro” is counties in a metropolitan statistical area of 1 million residents or up. This chart and the overall analysis in this story are based on the Centers for Disease Control county classification system. This publication has information on that system. Prescription medication accounts for about half of all drug deaths in the U.S., according to the Department of Health and Human Services. Data like this are behind recent efforts of U.S. Agriculture Secretary Tom Vilsack to call attention to what he and officials at the Health and Human Services Department call an opioid epidemic in rural America. Vilsack is head of an interagency project to raise awareness of opioid abuse. He has made appearances in Virginia, New Hampshire, Missouri, and other states since the initiative launched in June. USDA has awarded grants to develop telemedicine addiction treatment programs for rural areas. The analysis of prescription drug-abuse death rates comes from a research team at DrugAbuse.com, a for-profit drug education and research organization that also connects drug abusers with treatment facilities. 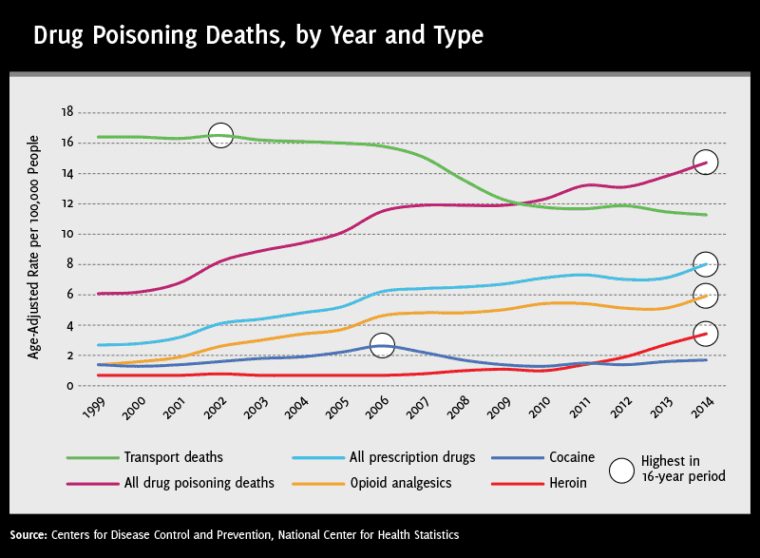 The analysis found that the prescription drug-overdose death rate was highest for the middle-aged – 45 to 54 year olds. It also showed that six of the top 10 counties with the highest rate of prescription drug deaths were in West Virginia. Ten of the top 30 were in Kentucky.